Apr 28 - The day "disaster struck"
It all started late Saturday afternoon while Bill and I were snowshoeing in the Sierras at the Carson Pass near Kirkwood Ski Resort. The snowshoeing started out great and it went well most of the day until disaster struck. We were on our way back at nearly 9,000 feet in a very remote area about 1.5 miles from the parking lot on Route 88 at Carson Pass. Bill started having shortness of breath, chest tightness and pain, nausea and he felt extremely weak. He couldn't walk 10 feet without enormous effort. We stopped to rest hoping it was just altitude sickness but he did not improve after 45 minutes. We were worried about darkness approaching and at 3:40 p.m. we agreed I had to go for help. His dog Raleigh went with me. Raleigh was a real trooper during this whole ordeal and it was very poignant to see how worried he was when Bill vomited. He definitely knew something was wrong. I was following our snow tracks back but it had been a warm, sunny day and they had melted in many spots and I managed to get lost. I'll be honest and tell you I was more than a little worried at that point because I knew time was not on our side. Bill had been the guide (as usual) but we didn't have maps because we had changed our route because the planned route did not have much snow. It took me more than an hour to get back to Route 88. But I came out of the woods 2 miles away from the lot which actually worked out better because I was closer to a store where there was cell reception. I flagged down a car and got a ride almost immediately from a nice, young couple with a dog. Unfortunately, in the excitement of loading Raleigh into a small car with another dog in it, I left my snowshoes and poles behind (a small loss). I called 911 and soon after the fire and sheriff personnel arrived. They were planning to hike in to locate him and then call a helicopter to take him out. I convinced them to let me go with the helicopter to find him and save time. They were reluctant due to safety rules and previous times when people were unsuccessful. I rode with the emergency helicopter and we located Bill (not an easy task without a map and 1,000 feet above ground) within 10 minutes of takeoff. And Bill, being the savvy out-doorsman he is , helped enormously by reflecting a mirror when he heard the helicopter. We landed and 2 great looking nurses named Kelly and Jenny gave him emergency treatment (nitroglycerin spray, oxygen and IV fluids). We loaded him onto the helicopter (Bill, it's time to lose some weight) within 2.5 hours from when I left him. It turns out Bill had a heart attack, not a major attack (but then again that's easy for me to say). In fact he did not think it was an MI when it occurred but he had 2 stents implanted Saturday night. I don't have too much to add. I never felt I was in any danger, aside from danger of staying the night out in the cold. I'm doing well now (upcoming posts will reveal that I'm back out on the trails). Mostly coming to grips with the fact that I maybe can't wander wherever I want in the mountains by myself. That's a bummer. 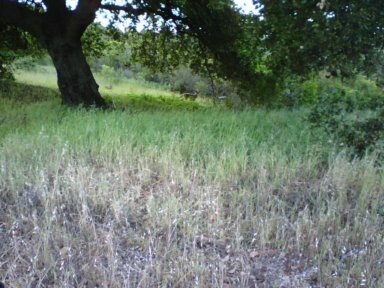 Saw this coyote under the tree on the right just before the Hayfield Tr reaches turns to climb up to where it meets the Toyon Tr. Our objective today was the northern edge of Fremont Older. When you reach the Coyote Ridge Tr., hang a right and go all the way to the end. When you reach the power line, there will be a turnoff on a trail down to Stevens Creek County Park. We went to this junction and turned around because it was getting dark. There's a little descent starting here and to go further would require climbing back up. Lots of deer in the usual place. Not much detail to add here. It was midweek (I was mulling my decision to quit AOL so skipping out early to use up my vacation days). 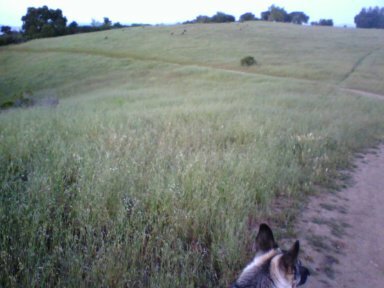 On this one, I think we went up the Hayfield Tr, left on the Toyon Trail, then Bay View Tr. to Coyote Ridge Tr. after a climb to the top of the little hill off to the right. Still out of the office, Raleigh and I headed to Almaden Quicksilver for a serious hike. WAIST Management had been there on April 1st. We basically went down the New Almaden Tr to some convenient point at which we climbed to the Randol Trail, the further on to the junction with the Mine Hill Road. We took that all the way back, descending almost to the parking lot off Almaden Rd. That left a fair climb back along the Hacienda Trail., then to the car via the Virl Norton Trail. I really pushed myself; around 12 miles in 4 hours, Plus some climbing. Saw a few deer along the way. Beautiful weather. Probably only one or two fellow hikers. I had a bit of a falling-out with new management at work late the week before so I took off the whole week April 9 - 13. On Tue evening I went out to Fremont Older to get in some miles with Raleigh. We went up the normal route: Creekside Trail to Cora Older Tr to Hayfield Trail. We took that up to the Coyote Ridge Tr (top of the highest ridge there). At this point, we turned right. I wanted to explore the trails that head this direction (north) because I had never been there before. It was getting dark, though so we hurried to almost the point where one trail turns off to the left to descend to the Stevens Creek County Park. This was just pass a big green water tank. We hit the turnaround time and immediately reversed course. It was almost dark by the time we got back. The lights in the valley below were beginning to glow. Oh, almost forgot: it was my Birthday; the big 4-8. The family (Malinda and Allison) were off to Boston this morning to visit colleges. Michael, Raleigh and I headed to Pleasanton Ridge Open Space Preserve (East Bay MUD). This park was of interest mainly because dogs are allowed. It's also close enough to warrant a visit on a Sunday afternoon. We climbed the hill by way of the Woodland trail. It has nice switchbacks and is way more appealing than the fire road. Once we reached the top of the ridge, we took the Ridgeline trail north all the way into some Pleasanton city park then connected to the Thermalito Trail to return along the other side of the ridge. We descended the Oak Tree trail [sic], really just a bad fire road. This is a pretty nice park. Beautiful at this time of year but probably hot in the summer. The trail goes through an interesting olive grove at one point. We saw numerous wild turkeys and I'm sure there are lots of deer (although I don't think we saw any). Good views from the ridge from Mt. Diablo down to Mission Peak. You can probably string out a good long hike here, too. We did 7 miles but could have continued along the ridge for 2 or 3 more, at least. There was water at a couple of points so it might not be that bad in summer; maybe I'll return. Bill Law CTO for W.A.I.S.T. Management and frequent SF bay area and Sierra Nevada hiker, backpacker, snowshoer. Often accompanied by his loyal hiking partner Raleigh.